Thank you Heather for this week's theme for Picture Perfect. Oh Wow Milli, this is stunning!! Rain drops on the petals, the crystal clarity of the flowers and even the little fly...its all perfect! Coming over to see yours. May be ... Sitting Pretty in Pink. It smells beautiful and as for the little insect it was taking a fresh drink from the rain drops on the petal. would look lovelier on my hair. ha! LOL want the rain drops too oh and the little insect? Can't wait for the Little man to arrive. Thanks You MJ. oh i'm missing spring now. ;) so pretty! Milli, this is so pretty,, love the freshness of the photo with the raindrops on the petals.. The color is so delicate. Thanks for sharing. Thanks for your wonderful comments and please note my sidebar and the special pink image I made for this months Breast Cancer Awareness Month. Where I grew up we had an apple orchard behind our house. I never paid much attention to the apple blossoms. After seeing this beautiful photo, I regret it. no no no. no rain and no bug, please. i'm so ocd. i also told you in fb. ha ha ha! you're gonna love him! Lovely and so fragile, a perfect reminder of how precious life is. Delicate but strong in the early warmth of spring. Very nice. The bug makes the photo, I think! Nature, and life, have imperfections. Mine came to nothing this year along with potatoes and tomatoes. Apple blossoms are great and yours is no exception. Perfect for the theme Milli. 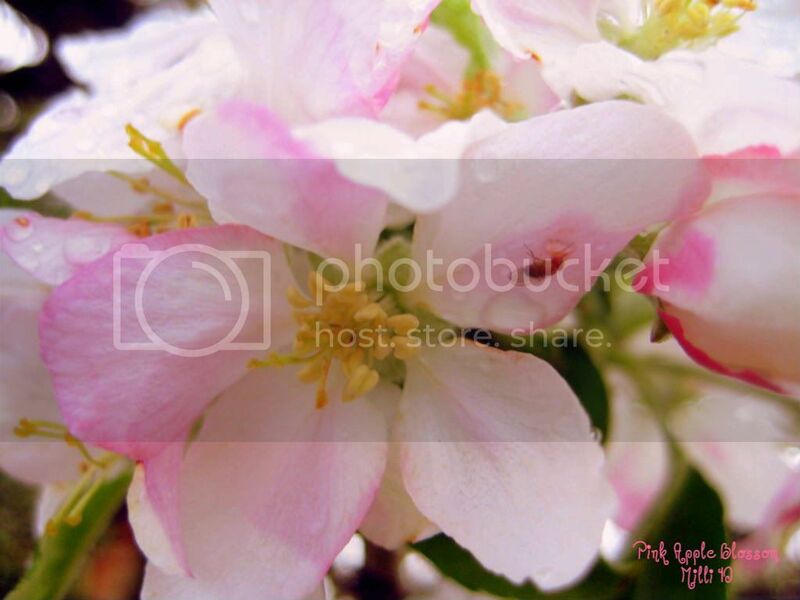 Mmm Pink blossoms making apples! Yum. They are lovely! This is one gorgeous picture. Soft and just perfectly shot. So soft and delicate ... A splendid macro shot. absolutely beautiful. I wish we had apple trees here. This really brings back childhood memories of playing in the apple orchard beside our house, and then later... stealing a salt shaker from the kitchen and climbing an apple tree to eat all of the green apples our tummies could hold. OMG loved the picture , especially the bee drinking water. nice one millie..i see raindrops!